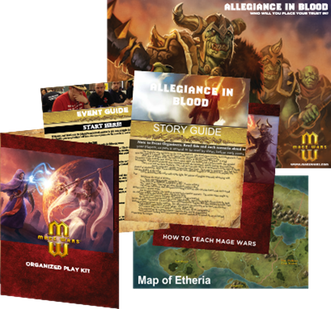 Arcane Wonders, makers of Mage Wars, made an announcement today about ALLEGIANCE IN BLOOD which will impact Organized Play and bring about some very cool new things for all you Arena Mages out there! Check out what's coming below with the official word from Arcane Wonders! Arcane Wonders® is proud to announce ALLEGIANCE IN BLOOD, our new Organized Play program for 2013! Our first OP Kit 1 was a smash sensation! The entire print run was sold out right away! Now we’re back again with Organized Play Kit 2, and bigger and better than before! 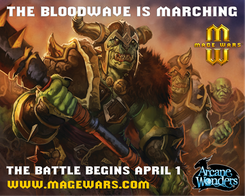 A gorgeous giant art poster showing the Bloodwave armies marching against Westlock! 12 page Story Guide with Map of Etheria and 9 exciting scenarios. Event Guide walks retailers through every step. How to Teach Mage Wars booklet helps retailers teach new players. Players won’t have to ever wait on Mage Wars® league play! We are committed to producing NEW OP KITS every 2 months. We will be tying these kits to the story behind future expansions and product releases. We’ll be releasing more in depth background information and providing website story supplements, enabling players to become deeply immersed in, and a part of, the Mage Wars® story. Our official release date for the USA and Canada is April 1, 2013! Players will be able to start playing the very first week of April! The kits are available for ordering at every game store NOW! Players: Please stop in and let your FLGS know you are interested in Mage Wars® organized play! Retailers: Order your kits now to ensure delivery on April 1. The kit is available to order at every major distributor worldwide! For more information go to www.magewars.com!